Elder Princess Shroob, referred to as Princess Shroob in-game, is a major antagonist and the penultimate boss of Mario & Luigi: Partners in Time. She is the leader of the Shroobs (her younger sister, Princess Shroob, is the second-in-command), an alien race that invaded the Mushroom Kingdom. When Princess Peach, Toadiko and Toadbert came to Princess Peach's Castle of the past, they met the Shroobs. Elder Princess Shroob attempted to attack Peach; however, Peach used the power source of the Time Machine, the Cobalt Star, to trap the Elder Princess Shroob inside. Peach then shattered the Star into pieces; however, the younger Princess Shroob still was able to capture Peach and trap her in Shroob Castle. Elder Princess Shroob trapped inside the Cobalt Star. 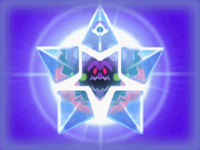 Throughout the game, Mario, Luigi, Baby Mario and Baby Luigi collect the various pieces of the Cobalt Star, not knowing that Elder Princess Shroob is actually trapped inside. When the brothers get to the top of Star Hill, the "spirit of the Cobalt Star" - actually Elder Princess Shroob in a disguise - appears and speaks to the brothers. It seemed that only Baby Luigi knew, since he was crying when "the spirit of the Cobalt Star" appeared. Various other characters such as Kylie Koopa and Toadbert hinted the fact that she was hiding inside the Cobalt Star, even as early as when the Mario Bros were in Yoob's Belly. 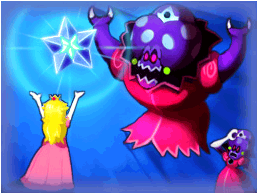 Finally, at the end of the game, after Princess Shroob is defeated, it is revealed that Princess Peach kept the center shard of the Cobalt Star. Peach tells the Mario Bros. that she cannot allow them to repair the Cobalt Star, but before she can explain why Baby Bowser comes in and steals the last shard, combining it with the five that the heroes had already collected; the Shroob Princess, now enraged over the recent death of her younger sister, turns Baby Bowser into a Shroob Mushroom and resumes her original form as Peach explains to the Mario Bros. what had really happened when she had gone back to that time period. Upon resuming her original form, Elder Princess Shroob promises to kill the Bros. as revenge for her sister's death and then activates the platform they were standing on, engaging them in battle high above Shroob castle. Notably, she says this in the language of the other characters, the only Shroob in the game who does that. Elder Princess Shroob is much stronger than her sister, and commands a fleet of Shroob UFOs. Her attacks depend on how many saucers are present; with just one, she can heal herself with a drink that recovers 120 of her HP, (80 in the Japanese and European versions) or summon a Shroobified enemy called a Shroob Chomp to attack Mario or Luigi. The UFO guides the Chomp towards a Bro. and the player has to quickly see which way the UFO is going. If two saucers are present she can ride on top of the UFO's and fire large energy blasts at the Bros. from the front; these come down much too fast for both Mario Bros. to jump over a blast at once, so they must pay attention to which hand the princess uses to fire the energy blast. The Princess then fires at the Bros. from the background, forcing both Bros. to jump if the Princess isn't lined up with the top of her throne before being blown from the UFOs and landing on the platform, causing a shock-wave that again forces the Bros. to jump at the same time. With three UFOs she can summon a Shroob Meteor, with which she attempts to crush the Bros. Every time more Shroob UFOs are summoned, Princess Peach throws a star to the Bros., with which they can knock saucers out of the sky and prevent Elder Princess Shroob from using some of her attacks. The Princess's only move that is always available is a headlong football tackle towards one of the brothers. The younger versions of the plumbers then have to hammer her away twice before she finally relents, further, only the last strike counterattacks. Occasionally she uses a tactic of stopping right before the targeted brother, tricking him into swinging his hammer too early and then quickly charging again; she reveals that she is going to stop by waving her hand wildly and gaining a crooked expression. In the Japanese and European version of the game, every time after the player attacks Elder Princess Shroob, a ! appears above her and she uses this attack against the Bro. who attacked her previously, no matter whose turn it is. 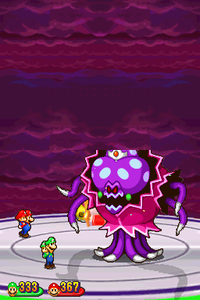 A screenshot of the Mario Bros. fighting Elder Princess Shroob's second form. Once Elder Princess Shroob loses 3500 HP, she activates her crown and morphs into a beast, which is her true form, and causes Princess Peach to faint. The Bros. must deplete 3,000 more HP from the Elder Princess Shroob to put an end to the Shroob invasion, but doing so is not nearly direct as it was in the first battle. In this second form, Elder Princess Shroob has seven parts: four arm tentacles, a group of leg tentacles, a crown, and her main body. She also has a particle effect surrounding her, flowing upward, though only in her full form. The leg tentacles and crown come back in about three turns after their health is depleted and each arm tentacle comes back in one turn. In order to defeat the Princess, the Bros. must destroy her leg tentacles and then deactivate her crown, otherwise all attacks directed against the Princess's head only deal 1 damage except for her giant laser ball attack, which when countered does a small amount of damage. Each body part has different attacks usually going in the order of feet/head, tentacles, and then the feet's tentacle sweep attack. This move that can be dodged by jumping is eerily similar to Cackletta's arm swing attack in her ghost form. Once she has taken a certain amount of damage, she uses three tentacles instead of two. The feet have three attacks in total and each one is synced with the head; one move is where the Shroob royalty backs up with her feet and then spits out poisonous clouds of gas like the one Swiggler uses but is dodged by jumping. Another is the one mentioned earlier, the tentacle sweep. The last is the rarest attack of them all; she backs up, summons a Time Hole and six saucers, and spits a giant laser ball that hits the saucers, causing them to either burn or short-circuit and then fall into the time hole, after which she resumes her attacks. The next turn, if the legs aren't destroyed by then, the Time Hole is opened again and the saucers attack either Mario or Luigi. The burned ones attack Mario and the shocked ones attack Luigi, a reference to Mario's Firebrand and Luigi's Thunderhand abilities from Mario & Luigi: Superstar Saga. They come in the order that the giant laser ball hits them, the first one the giant laser-ball hits is first, and the last the giant laser ball hits is the last; all of these UFO's must be flung back at the Elder Princess Shroob with a hammer. Elder Princess Shroob's mushroom form. Her head only has one attack; and that is summoning up a giant laser ball and hitting saucers with it identical to the Time Hole attack except without the Time Hole. Her tentacles have three attacks. One is to grab the Bros. and throw them. The babies must hit the tentacles together repeatedly as they slither forward to prevent her from grabbing them. This attack can not hurt Princess Shroob in any way when countered, but needs both bottom tentacles to activate. Another attack is to shoot a huge laser ball into the air then throw red and green energy balls into it. The ball falls towards the Bro. whose colors match the highest number of colored blasts that were absorbed by the orb. It can be countered solely with hammers. After the giant energy ball is countered by the targeted brother, it falls towards the other one and must be knocked away again. This strike sends it straight into Princess Shroob's face, damaging her. This attack needs both top tentacles to activate. Finally, her last attack is to stab a brother with the tips of her tentacles. The tentacle shines first before attacking. Each tentacle is assigned to a brother, right for Mario, left for Luigi. Her top right tentacle hits above Mario and is only used when there is no top left tentacle. The top left tentacle hits above Luigi and is only used when there is no top right. This attack is only used if both bottom tentacles are present. When Elder Princess Shroob is defeated, she becomes a Shroob Mushroom, although not before gloating that even with her defeat, the Shroobs will ultimately best the Mushroom Kingdom regardless. Mario, Luigi, Baby Mario, and Baby Luigi take it to the present Peach's Castle for it to be analysed by Professor E. Gadd. However, when they get there, they find Bowser lying unconscious on the floor. The mushroom that was Elder Princess Shroob comes to life and inserts itself inside Bowser's mouth, fusing with him and creating Shrowser, who instantly regains consciousness and attacks the heroes. Despite being unable to attack Shrowser directly, the heroes prevail and the Shroob threat is eliminated. The characters, after bidding farewell, then return to their own timelines. Elder Princess Shroob was one of many Shroobs seen in the cold room of Bowser's Castle during Mario and Luigi's fight with the Shroobs in Mario & Luigi: Bowser's Inside Story. She appears in full view in the background of the battle, as do many other types of Shroobs; outside the battle, Elder Princess Shroob can still be barely seen, mostly cut off by the top of the screen, while there are fewer of the other Shroobs. The room is overall much smaller than in the battle. In Mario & Luigi: Bowser's Inside Story + Bowser Jr.'s Journey, Elder Princess Shroob reappears as a cameo. Princess Shroob is seen next to her, and she is able to be seen more clearly. The Elder Princess Shroob's appearance in the Super Mario-Kun. Elder Princess Shroob appears too briefly for her personality to be explored in-depth, but her short appearance does give some basic traits of the Shroob monarch. Elder Princess Shroob seems to have cared a lot for her sister and swears her life into avenging Princess Shroob's death: indeed, Elder Princess Shroob never makes any mention of her own ambitions for power in-game. However, she still seems to have had many of the bad traits Mario villains tend to show. She seems to be deceptive and manipulative, as shown by her convincing the Bros. to repair the Cobalt Star under the guise of it being a 'star sprite': she also does not appear to be particularly appreciative and is highly condescending, as she then responds to this favor by promising to bring death to the Bros and insults them repeatedly in the process, referring to them as "foolish mushroom heads." In addition, in spite of the confidence she shows in her people's abilities during her final speech, she does not visibly show any concern at all for her own people. Whenever a Shroob UFO performs a task for her, she knocks it away, even for simple tasks like bringing her a drink of Vim; when she turns into a beast, she is even more destructive, shooting down her own UFOs so that they hit the Mario Bros. Nonetheless, she has confidence in the success in the invasion of the Shroobs, as evidenced by her last words to the Mario Bros. where she stated that, even with her defeat, the Shroobs will ultimately be victorious over the Mushroom Kingdom. Elder Princess Shroob resembles her sister, but is bigger and has a hunched body, crooked jaw, green earrings (although she has no ears), pincer hands, and a different suit. In her true form, her limbs are replaced with tentacles and she's grown into a larger size. Level 30 (31) Notice: Stats in parentheses are from the Japanese and European versions (if they differ from the original American release). Level 31 Notice: Stats in parentheses are from the Japanese and European versions (if they differ from the original American release). "I LAUGH AT YOU. MUSHROOM HEADS. PATHETIC THINGS." "YOU GATHERED THE COBALT STAR SHARDS WITHOUT EVER GUESSING THE TRUTH! NOW I AM FREE! AND THAT HORRIBLE, HORRIBLE COBALT STAR IS NO MORE! "I FEAR NOTHING NOW! DO YOU HEAR ME? NOTHING!" "I WILL GIVE YOU A SPECIAL REWARD FOR SETTING ME FREE. YOU WILL LOVE IT." "AND MY SISTER... MY DEAR, SWEET, BEAUTIFUL SISTER... I WILL AVENGE HER!" "FOOLISH MUSHROOM HEADS... YOU MAY HAVE BESTED ME, BUT SHROOBS WILL LIVE ON... ONE DAY, THE SHROOBS WILL DANCE ON THE BURIED REMAINS OF THIS PATHETIC KINGDOM..."
In the North American version of Mario & Luigi: Partners in Time, the Elder Princess Shroob's crown is given an attack rating, although the crown never actually attacks, as its purpose is to simply protect the princess from damage. In the Japanese and European versions of the game, this has been corrected, as the crown has a Power rating of 0. Elder Princess Shroob is the only one of her race who talks in a comprehensible language (without the dialogue being put between parentheses and under the alien/Shroob-language dialogue). However, her dialogue is all in capital letters. During her attack where she strikes down her saucers, it is possible for the player to counterattack her attack until her HP reaches zero, and then get killed by the remaining saucers. If this happens, then she does not die, and the player gets a Game Over.